In most comedies, there are two types of characters that need to exist in order for the humor to work: the laugh-getter and the straight man. The laugh-getter is the one who causes the chaos, while the straight man is the one who reacts to it, often making the situation even funnier. Force Majeure is a comedy of sorts that is filled with characters who solely react to the world around them as they all reach the verge of total meltdown. Force MaJeure is a constant battle between pleasantry and misery. A Swedish family goes on vacation in the French Alps. Their dynamic is flawlessly set up in the first scene, when a photographer really has to force them all to smile. This is a family that looks normal, but has no idea how to behave normally. Tomas (Johannes Kuhnke) is more attentive to his job than his family, which leaves his wife Ebba (Lisa Loven Kongsli) mostly alone to take care of their two children, who spend most of their days playing games on their phones. You darn kids and your cloud devices! The family doesn’t yell or fight with each other very much. Instead, they mostly ignore each other, and that can be a lot worse. Hey, at least when you argue with each other, there is the chance that it could lead to change. Tomas and Ebba are finally forced to confront their problems head-on after witnessing an avalanche. This event highlights all of the problems with their marriage. There is a chance that Force Majeure isn’t for you. If so, that is fine. Like a gym in January, this is supposed to be a judgement free zone. While there is an avalanche, there are no crazy rescue scenes, and there is minimal CGI. Basically, this film is about a bunch of Europeans discussing the moral and ethical implications of surviving a natural disaster. Force Majeure is what would happen if Michael Bay made a movie where all the characters argued about how they handled a robot invasion and you see only about two seconds of the actual robots. A lot of critics found Force Majeure to be hilarious. However, I have always been suspicious of critics who call a film with subtitles hilarious because a lot of them have a tenuous grasp of this thing that many of us call “humor.” That is of course not to say that foreign films can’t be funny (does Borat count? ), but that nobody really knows what funny means. For me, I didn’t find myself cackling until the ending, especially one scene involving some hilariously staged sobbing. 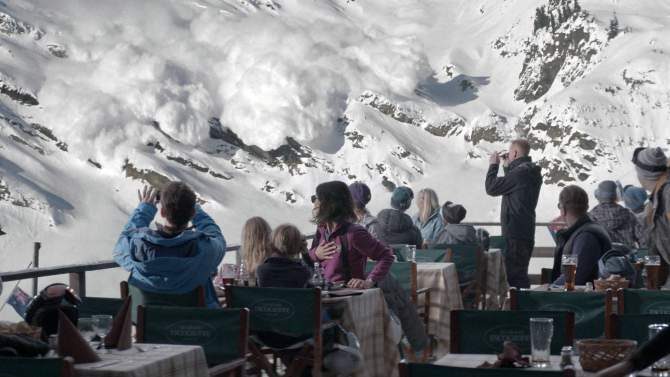 I am not going to sit here and analyze why Force Majeure didn’t make me laugh as much as it made other people laugh. I can say that I didn’t “get it,” but maybe you will. Force Majeure sure is pretty to look at. The ski slopes and fancy hotel are decadently shot and along with the chapter format that it is split into, this is the equivalent of a Swedish Wes Anderson film. Like Anderson, director Ruben Ostlund has an excellent eye for how dysfunctional people behave and interact. Ostlund shoots wide and far away. He clearly enjoys the feeling of detachment. Force Majeure entertained but didn’t spellbind me. It bites off a lot, and I was surprised by how much I was still thinking about it long after the credits rolled. Maybe it is the ambiguity, or maybe it is because it suddenly brought to mind a lot of old memories of ski vacations past, but it has a greater impact if you let it sit around and stir in your mind for a while. Patience, as they say, is a virtue. Now, quit starring at your screens! Nothing like some good old fashioned Scandinavian passive-agression! The family’s hotel room number was 413. FANS OF THE SHINING AND/OR CONSPIRACY THEORIES, WHAT DOES THIS MEAN?! It’s hard for this film not to trigger memories for ski trips past. Mainly, that ski boots are the most uncomfortable kind of footwear ever invented. My favorite part about skiing was when it was over and I was able to take my boots off and either drink hot chocolate or beer depending on what my age. Look on the bright side, at least Tomas didn’t react like George Costanza. This entry was posted in Uncategorized and tagged Force Majeure, Foreign Film, Movie Review, Sweden on January 3, 2015 by ian0592.